The Balanced Boater: Simon and Adrain - Congratulations! Simon and Adrain - Congratulations! When I first met Simon Maguire in March this year he told me about his plans to paddle from Byron Bay to Newcastle and I knew he was serious. Although he had very little sea experience it was obvious that he was committed and his mental and physical preparations were underway. That is not to say that Simon and his mate Adrian were making a fuss, in fact I suspect that without a good cause to promote and support they just would have quietly gone about their preparations and launched with as little fanfare as possible. So after a few months to hone skills and fine tune equipment they set off on a 600km open water paddle facing sea from every quarter, headwinds, landing heavy boats through surf and crunching out the miles when they really needed to. So congratulations Simon and Adrian! An open coastal voyage of this scale is a credit to you and one that you can always view with satisfaction,whilst raising money for a cause and taking a stand in support of victims of crime broadens the significance of your acheivment. After a 600klm paddle you might be excused for thinking that Simon would want to give himself a break from kayaking? Not according to an SMS he sent yesterday in which he says:'''Keener than ever to paddle and increase my skill level"
Thanks Rob. The sessions I had with you certainly helped me feel a lot more prepared. All the best and see you on the water for some more sessions soon. 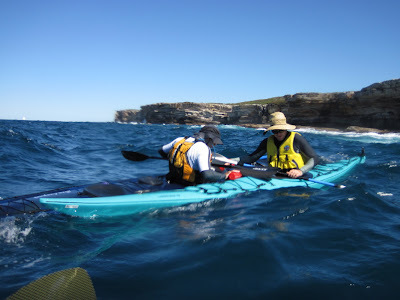 Rob is a highly qualified sea kayak instructor, holding an Advanced Sea Kayak Instructor and Assessor under the Australian canoeing award scheme, as well as being one of a handful of sea kayakers currently serving on the Australian Canoeing National Education and Safety Committee. Rob is the principal of the registered National Training Provider trading as "The Balanced Boater" offering commercial instruction to individuals and small groups at all levels (including expedition preparation, surf and rolling skills and instructor training). His clientele range from novice to experienced paddlers looking to enhance their skills before undertaking a major coastal expedition. Rob's trips resume includes crossing the notorious Bass Strait between the Australian mainland & Tasmania. He has also undertaken several unsupported coastal expeditions. These have so far included trips among the far north Queensland Islands, spanning the coast from the Tropic of Capricorn to Torres Strait, including Cape York.